Well...How did I get here? " I know I'm not the only one that stops now and then and wonders how their life became something very very different from what they imagined as a 12, 15, or even 20 year old." Set goals," they said. "Make plans," they said. What they should have said was, "put on your seat-belt and hold on for dear life. This life is a roller coaster that never stops!" Sometimes I wonder where I am when I look around. It is like a strange, foreign land. Some days I feel like all I can do is keep my head above water. Kids in trouble, bills piling up, house a disaster....it is easy to want to just slip under the tide. I didn't ask for this. Or did I? This is not my beautiful wife"
Being in the single world has introduced me to many people, both men and women, that had ended up in a life they did not ever imagine. Choices people make, turns in the road, unforeseen health issues...they are all propellers that send us into uncharted waters. We are given opportunities to learn, grow, and become very bitter if we wish. Sometimes, the change in course was due to nothing in our control. We feel like we have been suddenly thrown overboard on a clear sailing day, only to end up in a swift current full of sharks. "Why me?" "Why now?" "Why am I the only one that seems to be suffering?" It's all so unfair. Or is it? My God!...What have I done?!" It's easy to second guess yourself when you feel like you are drowning. It's easy to look everywhere else for answers than the place you know they are. You may feel like the Lord has left you alone and you can't turn to Him anymore. I've been there. I've seen that. I know many who are in that deep pit of despair. Why do we jump in that pit? Remove the water at the bottom of the ocean"
I don't know what the Talking Heads were referring to in their song. As far as I know, the only requirement for songs in the 80s was that they make no logical sense. However, I personally choose to look at this song as inspiration. "Remove the water at the bottom of the ocean." Let yourself go. Get out of the water or swim. Stop feeding your own misery and despair. Shakespeare is reported to have said, "The well of grief is emptied with our tears." Cry it out and get over it. Nothing can ever go back to the way it was. You can't make a butterfly back into a caterpillar. It just doesn't work that way. And honestly, we wouldn't want it to. 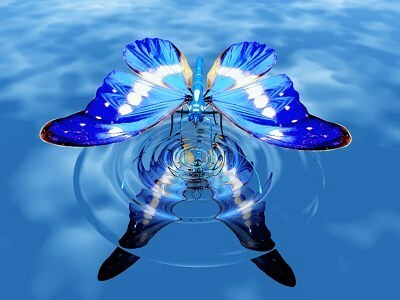 After the butterfly has flown...would it ever be happy only crawling along, slowly...? I think not. Take your challenges, your disappointments, your pain, and make something new and beautiful out of it. It is your time to fly. Cause I said so.